Innovate, evolve or get out of the way! That’s not the mantra of a famous business guru but it might well be because it’s very good advice. More to the point, after talking with Neil Ryan, head honcho of the Donnie Smith Show, and later reflecting on the show’s remarkable success in 2014, it occurred to me that this is exactly what Neil has done. Long lasting events, especially ones centered on a specific topic such as motorcycles, beat the odds by making changes and additions while maintaining a sense of familiarity. That’s been Neil’s MO during his dozen-year-tenure as the Show’s promoter and it’s apparently been a good formula. The show continues to grow, not only in attendance numbers but in popularity and reputation, too. But in 2014 innovation pushed the Donnie Smith show to ever new heights. 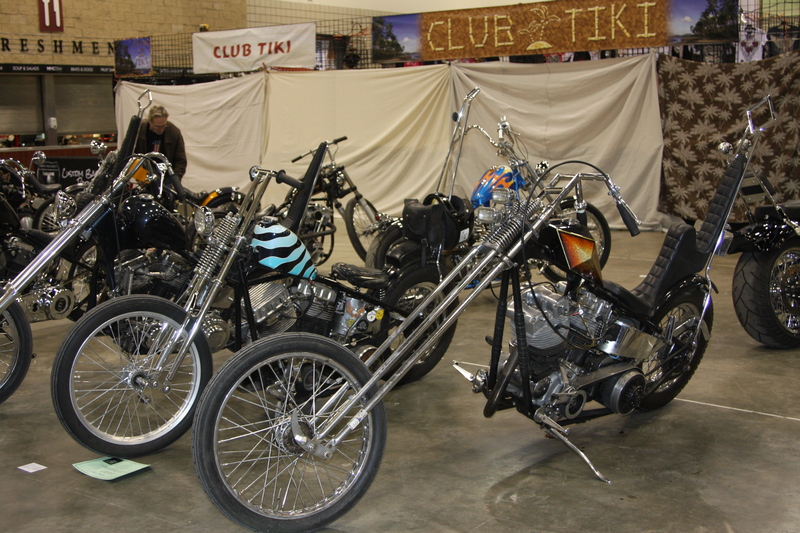 The actual bike show has always been the centerpiece of this event and rightly so. Midwesterners itching to get riding by mid-March never fail to impress, bringing a striking variety of machines out to shine. We’ve said it before and we’ll say it again: this show consistently brings out a stellar collection of custom bikes to the show floor. Custom builder Dave Perewitz says the quality of the bikes in the Donnie Smith Show is second to none, and he knows a thing or two abut the subject. The swap meet aspect of the event was a mainstay in this show’s origins as one of J&P’s Parts Extravaganzas. The persistent quality of the swap meet adds both interest and grassroots authenticity. This year the entire swap meet space was packed with vendors who brought out genuine parts and gear at fair prices. I heard more than one parts hunter lament not grabbing something before it went home with another buyer, while still applauding the selection on hand. A year or two ago, Neil added Saturday Happy Hour to the roster, bringing in a band at 5 PM and kicking the Budweiser wagons into high gear. Happy hour keeps people hanging out and lends a party atmosphere to the venue. And as this show always happens near Donnie Smith’s birthday, that’s appropriate. Beer and birthday cake? Bring it on! But that’s not all. 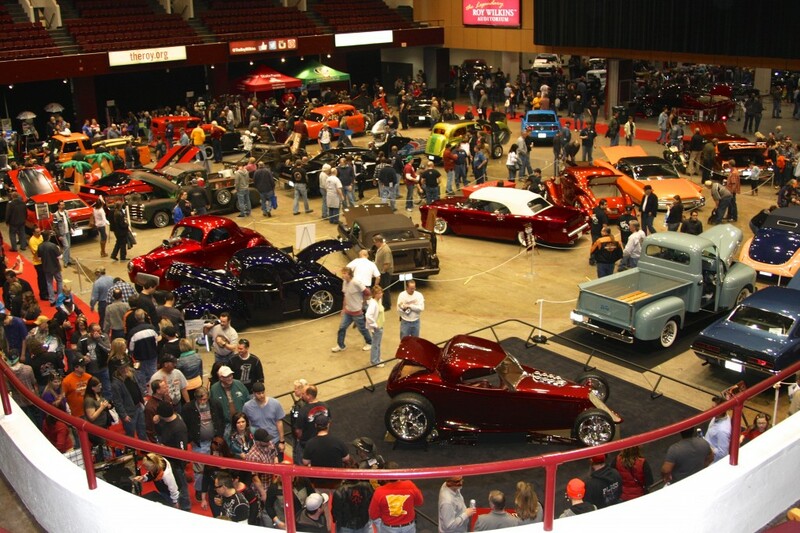 This time around the show expanded another gazillion square feet (okay, maybe just 50,000) into the adjacent Roy Wilkins Auditorium to include a classic car and hot rod show. A natural fit for a gearhead crowd like this, it also made sense as a way to further evolve the show. And it made more fun, too, adding another dimension, expanding the reach, and giving attendees more for their money. A component of the Donnie Smith Show these last 11 years that we’re especially fond of is the Donnie Smith Chopper Class Challenge, a competition between students of shop classes in high and tech schools. The program has expanded and contracted in the last decade in response to economic changes and school restrictions but it persists, to the good of motorcycling and anyone who cares about promoting our sport. This team of Ironworkers, formerly for IronWorks and now with Iron Trader News, has sponsored the DSCCC since its inception and we’re proud to do so. Two teams turned out this year, both of them veterans of the competition. Eden Junior/Senior High from Eden NY, led by instructor Steve Jones wowed everyone with a classic looking bobber sporting a diesel engine. Mitchell Tech in southeastern South Dakota turned out a slick, red, café-style racer looking slim, light and ready to roll. Outside of the DSCCC more young builders and designers populated the show. Kevin “Teach” Baas was on hand with his class from nearby Kennedy High in Bloomington, MN. As the longest running of the high school programs they’d been busy with several different bikes in various states and made stunning progress in spite of budget cuts that have Teach running not only Chopper Class, but auto shop, woodworking and more. It’s due to dedication such as this that Kevin’s students have gone on to advanced training in motorcycle mechanics, welding and other trades. Setting a good example still matters. Another high school group that, like Kennedy High, enters a bike in the open show classes rather than the DSCCC, is from Sturgis Brown High in Sturgis, SD. In their second year at the show, the students, along with a solid team of instructors and mentors, displayed their urban-bagger-style custom H-D Street Glide, complete with graffiti paint scheme and matching backdrop. 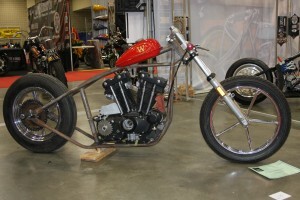 The bike, which took first place in the high school division, was built through the Buffalo Chip Student Build Challenge, aided by Keith Terry of Terry Components, Black Hills H-D, and Nick and Randy Cramer of Dakota V-Twin. 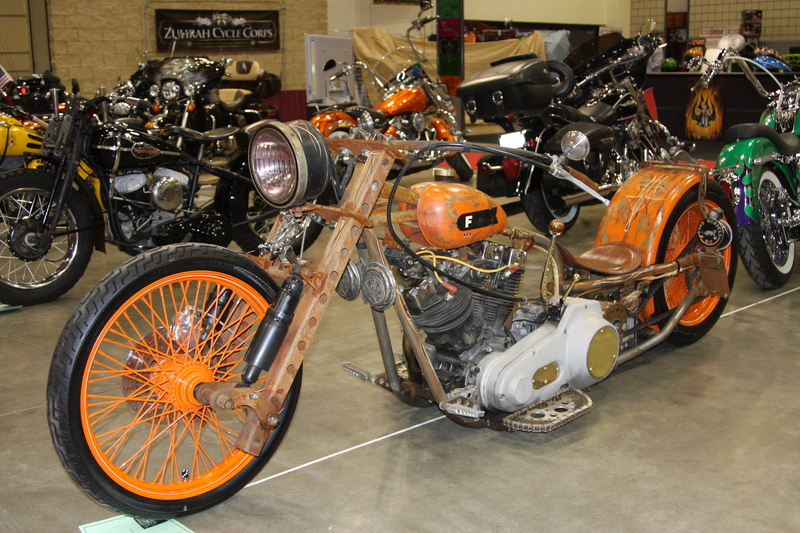 It will take center stage again at the Chip’s Legends Ride during the Sturgis Rally when it’s auctioned off for charity. Finding a cool bargain at the swap meet; hanging out with friends at happy hour; reminiscing about hot rods back in the day; getting ideas for fixing up your bike from the customs in the show; catching on to the enthusiasm of high school kids just getting into bikes; knowing that riding time is just around the corner. It’s elements like these that combine to make the Donnie Smith Show such a standout. Another thing that made the 2014 version even better? The people waiting outside in line to get in didn’t have to wait in the snow this time! 2014 Donnie Smith Show. Bookmark.